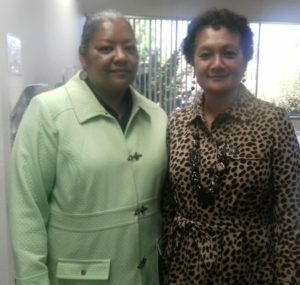 Ms. Diane Shepard, MA, LMHC and Executive Director, Ophelia Nowells debrief after the clinical session. Ms. Diane Shepard is our new therapist consultant from Shepard & Associates of Lakewood. Shepard & Associates is a small counseling/consultation agency with a variety of contracts. They provide services to parties from DSHS, DOC, Military, Insurance Companies, EAP and other small agencies. They also welcome the general public. Every 2nd Wednesday of the month, the JHV staff gathers to discuss their questions, concerns, and comments about their visitation clients with Ms. Shepard, a licensed therapist, who can provide both guidance, feedback, and information, drawing on over 20 years of experience in private practice. Her specialties include: Cognitive Behavioral Therapy, Domestic Violence, General Counseling, Counseling for Adults, Counseling for Children and Adolescents, Grief and Bereavement, Marriage and Family, and Chemical Dependency. The clinical session also provides an opportunity for the staff to share among themselves and learn from each other, recognizing that many of the issues and concerns that they confront with clients in the field are shared by others. To date, we have had two clinical sessions with Ms. Shepard and we’re thrilled to have her aboard. « Sharing a Commitment to Excellence!